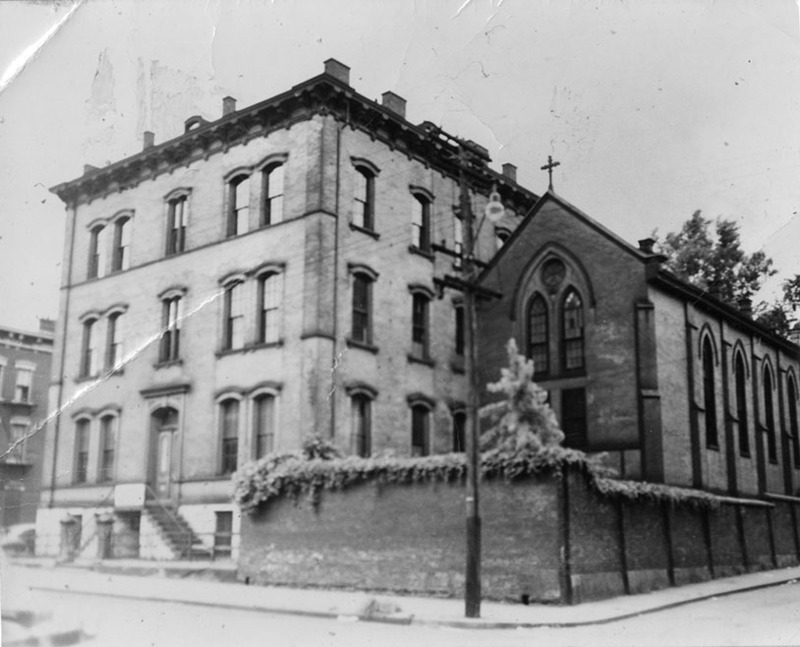 The Third German Protestant Church located at 829 Walnut Street, photo taken in the 1920s. One of my internship projects this year is developing a digitization plan for the Cincinnati German Third Protestant Memorial Church Collection (Accession number GA-09-03). Acquired a decade ago, the Third German Protestant Memorial Church was formerly known as the Third German Protestant Memorial Church of Cincinnati, the German and Evangelical Lutheran and Reformed Church, and the North German Lutheran Church. This collection spans 1814 to 1982 and includes records of births, marriages, deaths, confirmations, along with financial records and a few photographs. For the most part, it has been used by family historians but once it is digitized and available as a global resource, the records can be used by urban historians, religious scholars, ethnicity and immigration researchers, and many others, as well as providing excellent primary resources in teaching. The collection forms an important part of the University of Cincinnati’s German-Americana holdings but poses some challenges for digitization. The TPMC collection is composed primarily of handwritten German documents that need to be transcribed as well as scanned. Since transcribing foreign language documents adds an additional layer of processing, it is important to get a clear sense of the extent and composition of the collection. One of my first tasks in this project was creating a collection overview. After collating eighteen church ledgers and analyzing their contents, I discovered an interesting pattern with implications for both research and digitization. 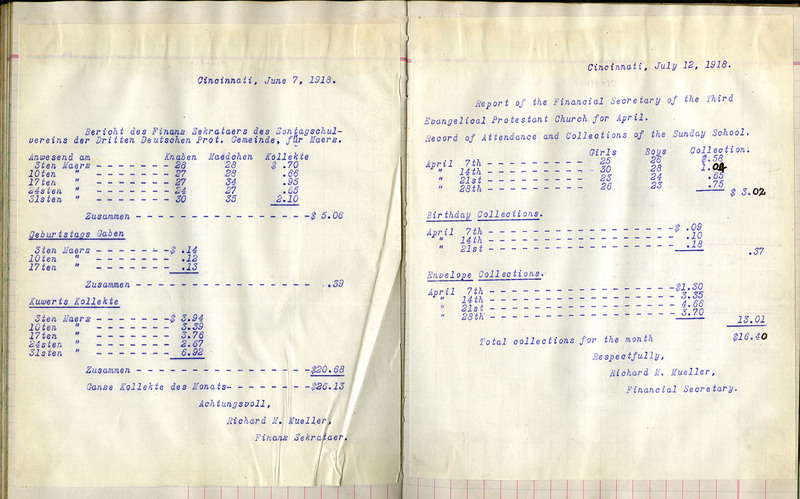 Although the collection is comprised of German and English language documents (approximately 5000 pages in total), 77% of the ledger pages are written in German. However, there is the clear language shift between 1918 and 1928. During these years, the language of the documents change from German to English, often seamlessly, as shown in the Sunday school ledger featured here. The language change indicates that by 1928 English had become the primary administrative language of the Third Protestant Memorial Church. 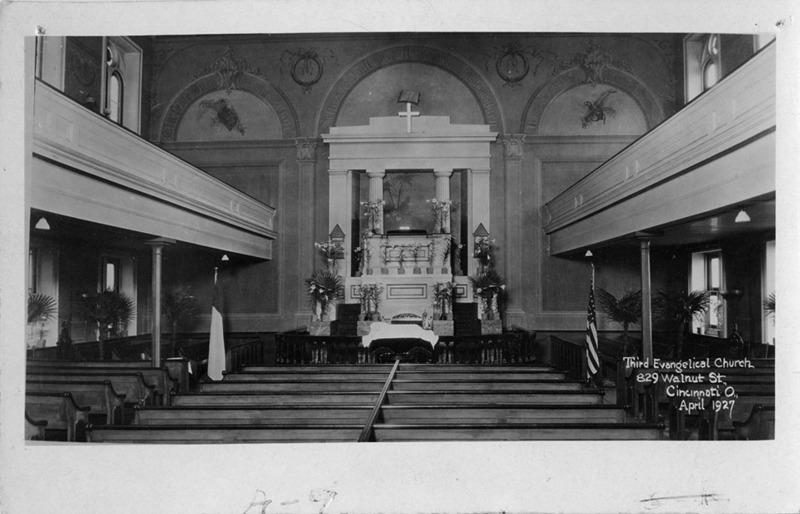 Altar of the Third German Protestant Church prepared for Palm Sunday, April 1927. While the collection overview might help scholars study language use within the Cincinnati German-American community, it also helps library staff more effectively digitize the collection. The divide-and-conquer strategy allows staff to precisely target resources that need more advanced processing while quickly moving ahead with less complex tasks. German language transcription requires specialized language and paleography skills, which can be handled by more advanced transcribers, while the English language documents can be transcribed faster and with less cost by trained students. Hopefully, this approach will enable the UC’s Archives & Rare Books Library to more quickly digitize the Third Protestant Memorial Church Collection for public use. To learn more about this collection, other holdings of the German-Americana Collection, or the Archives & Rare Books Library, call ARB at 513.556.1959, email at archives@ucmail.uc.edu, visit on the web at http://libraries.uc.edu/arb/collections/german-americana/ga-collections.html or http://libraries.uc.edu/arb.html, or find ARB on Facebook at https://www.facebook.com/ArchivesRareBooksLibraryUniversityOfCincinnati/. The Archives & Rare Books Library is located on the 8th floor of Blegen Library.